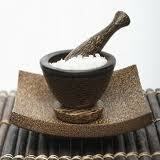 It’s Cold & Flu Season … Salt Room/Halotheraphy, Anyone? Two kids and one darling husband down with their first colds of the season. As the last woman standing in the house that sick built, what’s a girl to do? If you are anything like me, you’re alarmed by the constant recalls and changes in dosage and age guidelines on children’s cough and cold medicines. I found myself standing in the aisle of Rite Aid yesterday pawing through boxes of cough suppressants in a desperate search for a “natural” option. 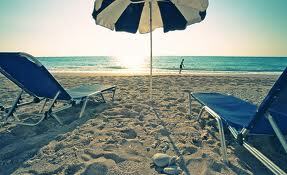 Nothing I found satisfied me, so I came home empty-handed. My go-to solution for coughing is honey. A spoonful or two of honey before bedtime. My kids are jubilant, of course, and I see results. The thing is, I don’t want to suppress the cough because I know it serves a purpose; I just want to help my children get a good night’s sleep. Sound old-fashioned? Don’t believe me? The Mayo Clinic confirms that “honey appeared to be as effective as the cough suppressant dextromethorphan in typical over-the-counter doses,” but reminds parents not to give honey to children under 1 year old. Most children will develop at least six to ten colds a year. This number increases for children who attend daycare. It is estimated that during a one-year period, people in the United States will suffer one billion colds. How Children’s approaches colds: Children’s experts have testified in front of the Federal Drug Administration (FDA) on the dangers of giving cough and cold medicines to children under age 6. Our physicians and researchers are also vocal about the danger of antibiotic resistance that can develop when antibiotics are overprescribed or prescribed incorrectly—for example, for the common cold. I am not an alarmist when it comes to colds and the flu. When my son was 5 months old, he was twice hospitalized for a week at a time with RSV and double pneumonia. Only after he fully recovered did I realize how terribly ill he had been. After that horrific experience, I can handle just about any sickness you throw my way, and I rarely seek medication for myself or my children unless it is truly necessary. That is perhaps why I feel like I’m sitting on a fantastic secret that I simply must share with other parents who want to alleviate symptoms of the common cold, allergies, and other respiratory illnesses with a noninvasive, natural, and drug-free treatment. Salt room or Halotherapy is a time-tested, natural technique that can help open constricted sinus passageways, loosen congestion, hinder the growth and spread of bacteria, lessen the frequency and intensity of allergy and asthma episodes, reduce bronchial inflammation, diminish levels of IgE antibodies, and boost your immune system. Halotherapy (from the Greek halos, meaning “salt”) is based on centuries-old experiences of people who spent time in the naturally occuring salt caves since the Middle Ages. In the 1800s, miners in Poland noticed that their lung function improved when they worked in salt mines formed millions of years ago. Today modern technology has brought the salt mines above ground in salt rooms that simulate the microclimate of an underground speliochamber. 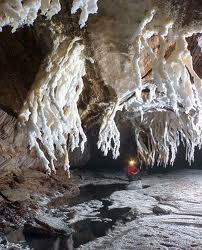 A salt room generally contains sea or mineral salt covered walls and floors. A patented machine called a halogenerator produces dry saline aerosol by mechanically crushing rock salt grains and blowing the dry salt aerosol into the rooms via a small opening in the wall. The small particles of salt can travel to the deepest and smallest part of the lungs to help open constricted airways and boost the immune system. While only eight such Salt Wellness Centers exist in the United States, halotherapy treatment is well known and popular in Europe and Israel. 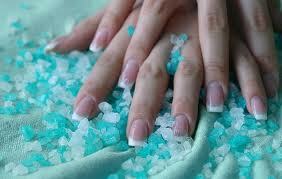 Etya Novik is the owner of Respira Salt Wellness Center, the first salt room therapy center in New Jersey. When my children, my husband and I entered her spotlessly clean, inviting facility this morning, my son immediately begged, “Can we stay here forever?” With soothing fountains and bright, airy rooms, Respira boasts a separate salt room specifically designed for infants and children up to the age of 10. Children don’t even realize they are receiving a therapeutic treatment as they passively inhale micro-salt particles. 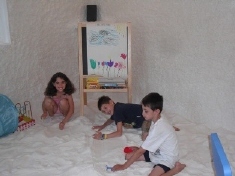 Instead, they happily dig in the pure salt sand, color, draw, read, listen to music and let their imaginations run wild in their personal “salt cave.” A parent must accompany children under the age of 8 in the salt room (and there is no additional charge for that service). When our 45 minute session was over, my children simply did not want to leave and couldn’t even be lured away with the promise of lunch and a visit to the nearby park, complete with a waterfall and fountains. So did it work, you ask? Novik recommends 12-15 treatments over a period of 8 weeks to maximize healing and then scheduling visits as necessary. Nonetheless, my children and husband were definitely breathing easier and coughing less after that session. The effects certainly weren’t long-lasting after only one treatment, but we all agreed that we’d be back at Respira soon. Whether you are looking for an alternative to over-the-counter cold medicines or a complementary therapy to conventional treatments, Halotherapy is certainly worth your attention. In addition to providing easier breathing, an hour in the salt cave felt like a day at the beach, an escape, a way to get away from the chaos outside, to nestle our feet into warm sand, to get quiet, and to visit in our mind’s eye those precious summer days that only ever so recently slipped from our grasp. This is an outstanding article & a very informative blog.